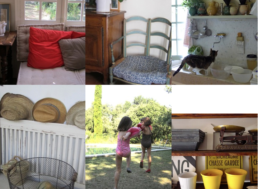 Pictures taken at La Bastide de Richeaume, a lovely B&B with tons of charm at very friendly price. Breakfast is served in the garden under a tree, with homemade jams, fruits, delicious bread and viennoiseries. Highly recommended! It's always an early wake up when coming to New York from London. What's so great about NY is that you will find life at any hour of the day. My daughter Jasmine and Iris were thrilled to be able to buy fresh mango and big blue bubble gums at a Deli at 6am.